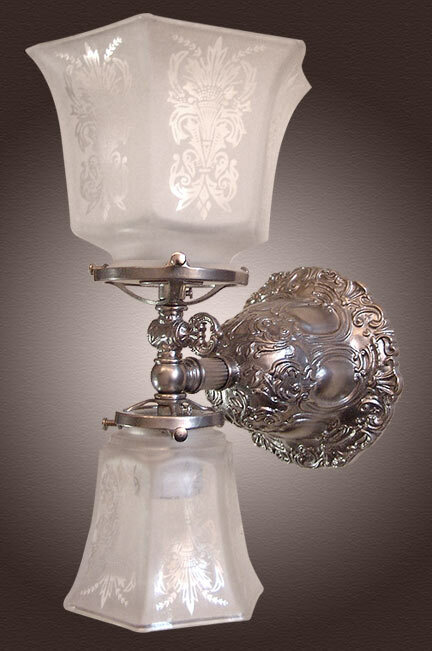 Another version of the 'Up and Down' French Gaslight in pewter. This one is shown with Hexagonal Acid Etched glass shades. Place it on either side of your vanity mirror or fireplace, or even beside your bed. An excellent foyer or library light as well. A very popular model for its bold design, function and high detail. Shown in Satin Nickel. Available in different Metal Finishes, different Glass, Back Plate, multiple arms and many other Custom Options. Width 6 In. / Projection 9 In. / Depth 12 In.